Providing miniature pneumatic components that meet our customer’s defined specifications has been a priority since Pneumadyne’s inception. As manufacturers of testing and measurement equipment require smaller, more compact products they turn to Pneumadyne for custom pneumatic components that will fit their machine and provide the function that they need. By developing integrated control systems, Pneumadyne engineers are able to reduce the size of their circuit, eliminate potential leak points and ease product assembly. Read more about the custom pneumatic controls developed by Pneumadyne engineers for use in testing and measurement devices: medical sampling, gas sampling, solvent extraction. Do you need to reduce the size of your pneumatic circuit? Contact our engineers to discuss your application requirements. Many of our standard pneumatic products are suitable for use in testing and measurement equipment. Our solenoid valves are offered with a variety of flow rate, voltage and connector options to accommodate system requirements. Solenoid manifolds are a compact solution for mounting multiple valves. Pneumadyne pressure regulators feature several porting options for plumbing convenience. 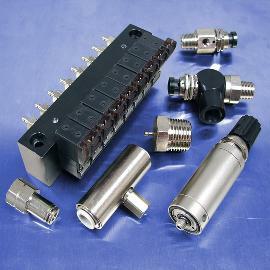 Numerous sizes and configurations of barbed, threaded and push-to-connect pneumatic fittings are available for connecting components throughout a pneumatic control system. Listed below are some of our standard pneumatic controls. Our entire product offering can be viewed by clicking on the top navigation (in the gray bar).